Azerbaijan is an ancient country with an amazingly beautiful and diverse nature, hospitable people, and unique culture and traditions. 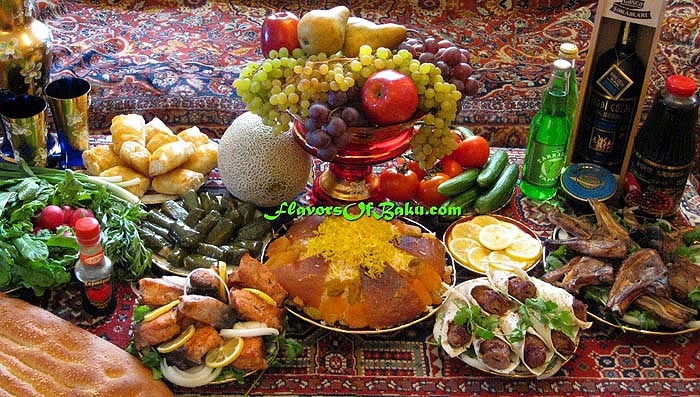 Azerbaijani cuisine is one of the most interesting cuisines in the Caucasus and deservedly enjoys wide recognition. A classic Azerbaijani meal typically lasts for about 3-4 hours and always begins with tea. Azerbaijanis uses mostly black leaf tea and brew it strong, usually with wild herbs (sage, thyme, mint, etc. ), and drink from special pear-shaped glasses called Armudu. The main course is served following the first and is also prepared with meat, poultry, and fish. The fish are native to the Caspian Sea and the range of fish dishes varies – fish Kebabs, soup Kyufta, as well as baked, fried, boiled, stewed, Pilaf with fish and even fish Dolma. Mainly sturgeon, salmon, white fish and others are used. Pilaf, as a king of all dishes, is always served at the center of the table. It is eaten between the second and the third course. Azerbaijani pilaf is prepared strictly according to certain rules, and differs in that all of its components are prepared separately. The type of Pilaf is determined by the previous courses. If the previous course included meat, then the pilaf is served with game or fish. If the game has been served as the first course as a soup and main dish included meat, then the pilaf is served either with eggs, herbs, or fruits. It is important to note that almost all pilafs are prepared with Saffron – the most delicious spice in the world. 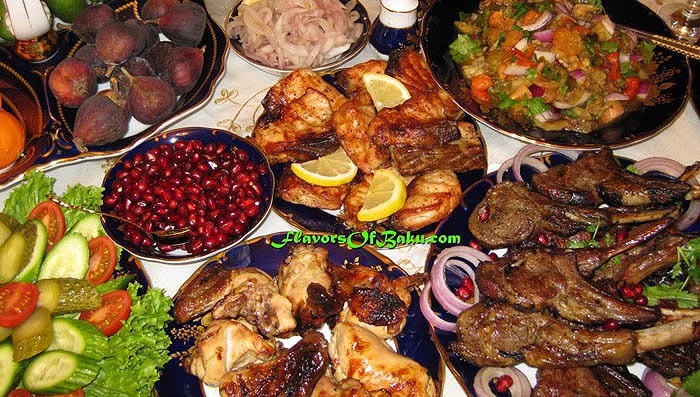 The main meat in Azerbaijani cuisine is lamb, but veal is used as well. Meat is used in the first and second courses in snacks and different dough products. Meats are abundant and versatile. They can be used as stuffing for dolma and as garnishes to pilaf. One of the most popular dishes in Azerbaijan is Kebab, which is lamb strung on skewers and fried on a barbecue using the smoke from burning coals. For kebab, a majority of the entire lamb is used–the kidneys and liver as well as the flesh. There exists a variation of kebab called Lyu-Lya kebab, which is composed primarily of minced meat, and Tava kebab, which is lamb in the form of round or oblong cutlets friend in a pan. Kebabs made of fish, game, and vegetables are very common in Azerbaijan as well. Narsharab, a sweet and sour sauce made from pomegranate, is often served with kebab. The Azerbaijani people eat their meals with sorbet, a drink made of sweet and sour fruit juices such as plum, lemon, grape, and pomegranate. Sorbets are served not only as a beverage, but also as a drink accompanying pilafs and meat dishes. All of the dishes served with bread called “Chorek”. Chorek is prepared from the fresh dough in a Tendir (a clay oven for baking bread and pastries). 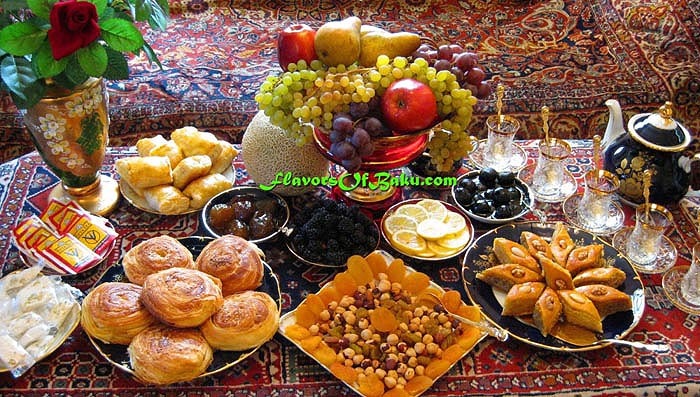 At the end of the meal, tea is served again with the nation’s world-famous sweet pastries – Pakhlava, Shekerbura, Gogal, Badambura, Keta and others. Different kinds of jams are served with the tea as well – walnut, sour cherry, cornel, sweet white cherry, and even rose petal. Don’t miss the chance to cook and taste the delicious Azerbaijani dishes.